Upcoming futuristic role-playing AAA title Cyperpunk 2077 is going to include online and multiplayer elements to make it "commercially even more significant," admitted CD Projekt Red CEO Adam Kiciński in a recent interview. In the wake of recent gamer / games industry clashes of interest, such talk didn't go without critical comments with some commenters getting hot under the collar over concepts such as online commercialisation, and gaming as a service. The video interview, embedded above with English subtitles available, didn't really give us much info about Cyperpunk 2077. The CD Projekt Red CEO only touched upon his dreams to make this the biggest game yet, with the greatest financial success to match that. However, it was admitted that there will be an online element. This admission is what seemingly got part of the gaming community jumping to various monetisation conclusions - one such report garnered a strong rebuffal via CD Projekt Red's Twitter account. 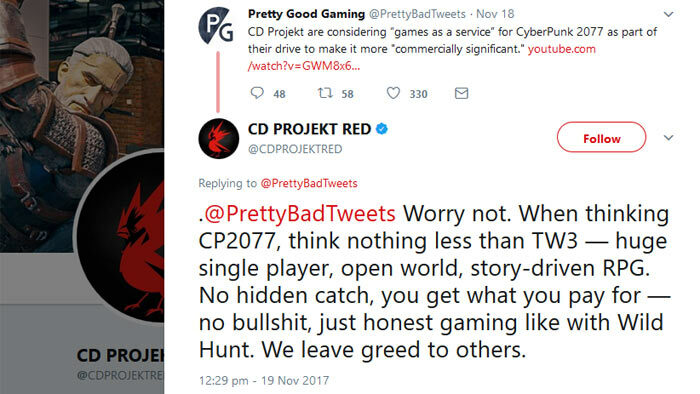 As you can see above, CD Projekt Red is rather vociferous in its denial of any intentions to make Cyperpunk 2077 a 'gaming as a service' model game. Its key claims are that those who buy the upcoming Cyperpunk game will get a similarly huge single player open world that players of The Witcher 3 were so delighted with, no catches, before ending with the rather punchy statement "we leave greed to others". CD Projekt Red has built up a lot of goodwill in the gaming community and as you can see, wants to keep this excellent relationship intact. “Proof is in the pudding” as they say. So many developers have promised one thing and delivered something totally different once the sweet scent of microtransaction and lootbox payday gets stuck in their nostrils. I think if there is one developer you can trust its CDPR; look at the amount of free dlc provided for TW3 and the quality of the paid dlc. Also if CP2077 is anywhere near the production values of TW3, its going to be worth waiting for; let them take as long as they need! Well they can't eff things up more than EA has done with battlefront 2. Also PGG is one of the best youtube gaming news channels I've found, it's cool CDPR have replied directly to them.